What Is the Sugar Content of Beer? Before getting to the answer of "How much sugar is in beer?" let's first get some background information. Usually made from barley or other malted cereal grain, beer is an alcoholic beverage that is brewed by fermentation and flavored with hops. You can also find some craft beers made with grains such as corn, rice or sorghum. You divide beers into two main categories – lagers and ales. The difference in temperature and the yeast used during fermentation determines the type of that beer. Lagers are fermented at rather colder temperatures as compared to ales; however, ales involve top-fermenting yeasts during the fermentation process that rise to the surface of the liquid. As for blood sugar getting more and more attention, people start to worry about the sugar in beer. Let's get more information. How Much Sugar Is In Beer? Beer has more carbs per serving as compared to wine or liquor. But how much does beer contain? Not much. 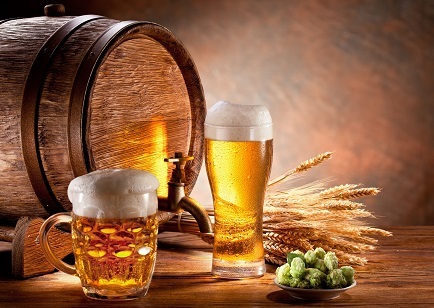 There is no need to add sugar during the brewing process to change the sourness, and whatever sugar is added here is converted into alcohol during the processing of beer. You will get 12g of carbs from a serving of regular beer with no sugar at all. Light beer may not contain that much of carbs (6g of carbs per serving) but it does contain about half a gram of sugar. How much sugar in beer usually changes with a change in brand. Here is more about it. Whether you drink wine or enjoy another type of alcoholic beverage, you just cannot avoid sugars. You already know how much sugar is in beer, so let us find out more about the sugar content of other types of beverages. The process of fermentation converts the sugar in grapes into carbon dioxide and ethanol. After the processing, very little sugar is left in the wine. You get about 1g of sugar in a serving of red table wines, whereas white table wines may have up to 1.5g of sugar per serving. The carbohydrate content of both red and white wines is about 4g per serving. While the sugar content is generally low in wine, it may change depending on the type of wine you choose. Dessert wine can have up to 8g of sugar per serving. Pina colada is loaded with sugar and a 4-ounce serving loads you up with 28g of added sugar. The same serving size of daiquiri contains 6.7g of sugar and none of this added sugar comes from the alcohol. Rum, gin, vodka, and whisky are free of sugar though. Knowing how much sugar is in beer gives you an idea about how much you should drink, but it is important to understand that drinking in excess can change your blood sugar level even if the original sugar content is on the lower side. Your blood sugar levels changes to some extend every time you drink alcohol. So even if you drink occasionally, alcohol can accelerate the production of insulin leading to low blood sugar. If it happens, you will experience fatigue and lightheadedness. You need to understand that sugar is important to fuel your body, and you should get it from health food sources, such as fruit. Heavy consumption of added sugar increases your risk of for dental decay and weight gain. It can also increase the levels of triglycerides in your blood and increase risks of cardiovascular issues. Women should limit their intake of sugar under 6tsp. a day, whereas men should not consume more than 9tsp. a day. Stick to this guideline and you will be fine.